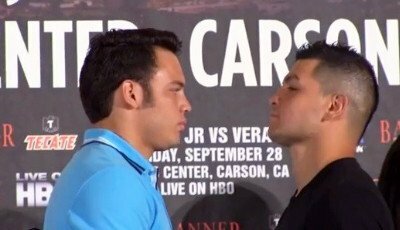 According to trainer Ronnie Shields, successful negotiations have taken place to append a new weigh-in limit for the big Saturday night showdown between Julio Cesar Chavez Jr. (46-1-1, 32 KOs) of Culiacan, Mexico and Bryan Vera (23-6, 14 KOs) of Austin, Texas. After the fight card’s final press conference convened this afternoon at the Crystal Ballroom of the Millennium Biltmore Hotel in Los Angeles, California, both parties, including promoters Top Rank, Inc. and Banner Promotions, reached an accord binding both combatants to a new weigh in limit of 173 pounds for this Friday afternoon’s weigh in ceremony. Although the added weight limit came as no surprise to most media members who had been following the current Chavez/Vera novella, veteran trainer Ronnie Shields made a surprise stipulation within the new fight agreement. Although most ringside observers wouldn’t think a ten round stipulation would make much of a difference on fight night, the experienced trainer insists that the abridged contest will make a big difference in terms of pace and strategy. Conventional wisdom would say that not having to melt down to 168 pounds would be a sizable advantage for Chavez leading into Saturday night’s bout. READ Lomachenko As Big As A 100/1 Favourite Over Crolla – The Biggest Boxing Upset Ever Scored By A Brit If Crolla Pulls It Off? Despite giving away an additional five pounds on the scales during Friday’s weigh in, the Houston, Texas, based trainer asserts that the added weight really won’t help Chavez Junior as much as most think. The ten round main event is set to take place at the StubHub Center in Carson, California, and is slated to be broadcast on HBO Championship Boxing with a start time of 10:15PM EST/PST. The weigh in is scheduled for 6PM EST/3PM PST on Friday afternoon.